The boys and I were pulling weeds today. I have this area behind the house that has for the ten years driven me crazy. This year I am determined to get it cleared out and mulched in. Spencer throws the rake down and rushes over to see. He was totally amazed that he (or she) has grown so much. I place my weeds in the bucket and walk over to check it out. 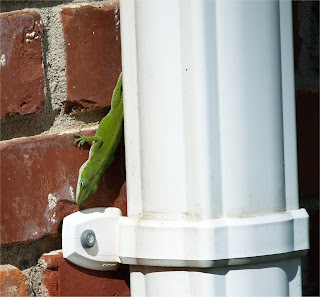 Yep, the little lizard was hiding under the gutter. I quietly went inside the house to grab the camera so I would not disturb our little friend. These little lizards are so neat, and I look forward to seeing them every year. Last year, we had three around the house.